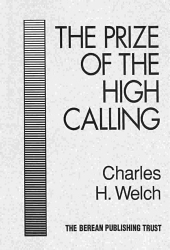 The Prize of the High Calling by Charles H. Welch. This book is an exposition of the epistle to the Philippians, and derives its title from chapter 3:14, "I press toward the mark for the prize of the high calling of God in Christ Jesus." The purpose of this book is to exhort believers to service by examples of our Lord first, then Paul, Timothy, and Epaphroditus. The Lord's desire for each of us is that we grow from newborn Christians to full grown adults. We can accomplish this by keeping our eyes on the end that God has in view. The writer starts out by suggesting that Paul's prison epistles contain the gospel of salvation for us Gentiles. Our hope, calling, and walk are revealed in the five epistles Philippians, II Timothy, Ephesians, Colossians, and Philemon. Mr. Welch suggests that we follow the instructions of II Timothy 2:15 to "rightly divide" the truth. This can be accomplished as we heed the exhortation in Paul's prison letters. The scope of Philippians concerns our state, not our standing, before God. In paralleling Hebrews and Philippians we find the admonition to go on unto perfection or press toward the mark and not draw back unto perdition although different callings are in view. There is a leaving behind and a going on that is necessary for the growth of every believer. The author advised us that we can be better servants of our Lord by "approving things that are excellent", Philippians 1:10. This is done by comparing the instructions given in the prison epistles with the other books in the Bible. The writer does not go to every verse, but rather gives some examples to help us on our way to truth. The next topic examined is what the apostle Paul means when he states that he desires to depart and be with Christ in Philippians 1:23. The orthodox view is presented and then Mr. Welch explains his thoughts. Our citizenship which is in heaven and revealed in the gospel of Christ is covered in chapter 4, and the mind which is in Christ Jesus in the topic of chapter 5. Chapter 6 is entitled "Working out the Truth". The example of Christ's utter humiliation is reviewed, followed by Paul's life being poured out as a drink offering. There is not enough space to comment on the remaining chapters, however they are most worthy of your time. In closing, we feel that you will find this to be on of the most encouraging books that you will ever read. What is the prize of the 'high calling'? Read this book, and discover for yourself.